Franklin Matters: Remington Middle School PCC kicks off the "Rally for Remington"
Remington Middle School PCC kicks off the "Rally for Remington"
The Remington Middle School PCC is kicking off our annual Direct Donation program for Remington, Rally For Remington. The funds raised through this program help to pay for programs for the students, including cultural enrichment, field trips, and much much more! We want to be able to help mold and shape the minds of our young students. 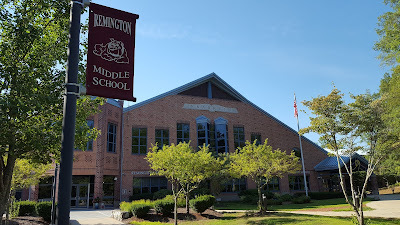 If you are unfamiliar with us, we are a parent volunteer organization whose mission is to positively impact the lives of the Remington Students. We are looking to the community for help this year as we have not met our goal in recent years due to many factors, most prevalent is the increase in the cost to provide quality programs. While our Remington family has contributed, we are asking for your help to keep our quality programs continuing for the benefit of the students. All of the monies raised, 100%, stays in Remington and is not used for anything other than programs to benefit the students. We hope that you will consider making a onetime donation to Remington Middle School so that we can continue to provide these important programs for the students. You can make your donation by PayPal, or sending check or cash to Remington School PCC, 628 Washington Street, Franklin, MA 02038. Thru PayPal, a receipt will be generated and sent to you or we can send you one at your request for check and cash donations. The Remington Parent Communication Council, Inc. (“PCC”) is a 501-C(3) corporation. As defined under the Internal Revenue Code.